Coverage of esports is slowly but very surely gaining traction via major media outlets, and BBC Three – which provided Gfinity Elite Series coverage last summer – is going to broadcast the semi-final and final of the UK’s first ESL Dota 2 major this weekend. Live coverage of the ESL One Birmingham 2018 will kick off tomorrow (Saturday, May 26) at 2pm when the semi-finals are played, with the grand final being shown on Sunday at 3pm. 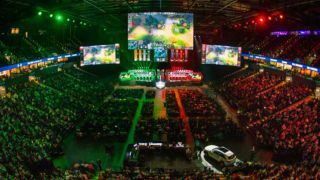 The tournament has a total prize pool of some $1 million (£750,000, AU$1.3 million). You can watch with BBC iPlayer or via the BBC Three website (it’s an online channel these days, in case you missed that development), and this, the Broadcasting Corporation notes, is the first time that an ESL event has been shown live on the Beeb. Julia Hardy, of BBC Radio 1 fame, will be presenting, backed up with pro Dota 2 casters Gareth ‘Gareth’ Bateson and Shane ‘Shaneomad’ Clarke commentating on the action as it happens. Just as with any big sporting event, you can expect some preamble to build up the atmosphere, including interviews with the top Dota 2 players. Last year, BBC Three entertained us with action from the Gfinity Elite League Series One, featuring pro gamers battling against each other on Counter-Strike: Global Offensive, Street Fighter and Rocket League. BT also provided Gfinity Elite coverage, and of course, we’ve seen esports come to Sky, as well. With the growing number of gamers interested in watching the experts play, and the prospect of esports becoming part of the Olympics eventually, it’s surely only a matter of time before we see more big tournaments being broadcast on mainstream channels.